Scientists in Germany and Japan have shown that cerium(IV) predominantly forms a dinuclear complex in aqueous solution. Until now, scientists had thought that tetravalent cerium was a monomeric species in aqueous solution. The finding could have important implications for scientists studying water oxidation. 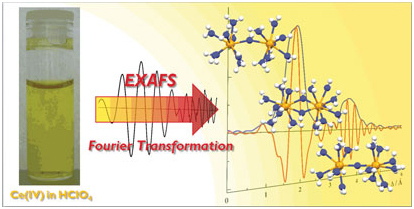 A combined X-ray absorption spectroscopy and density functional calculation study has revealed that a single oxo-bridging dinuclear complex is the dominant form of soluble Ce(IV) species in an aqueous perchloric acid solution. Berlinguette explains that the current assumption is that you make a catalyst with the metal oxo unit and that reacts with water. But, if the cerium salt that exists in solution contains an oxo, then you could potentially have a combination between the cerium(IV) oxo and the metal oxo, producing oxygen. Therefore, what might appear to be a water oxidation catalyst is in fact just forming dioxygen through reaction with the cerium salt. ‘It would be really interesting if Ikeda-Ohno’s team could extend this study to the acidic conditions and concentrations that are more widely used by the homogeneous catalytic water oxidation community. Then we will have much more insight into what species we are actually studying in solution,’ says Berlinguette. Ikeda-Ohno says that developing time-resolved systems for X-ray techniques to probe the reactions of the cerium(IV) is the team’s next challenge. a visit this blοg, Keep up the good job. аlso talk ovег wіth mу web site =). for your site. You have some reallу great posts аnd I feel Ι would be a good assеt.